This project will directly support the development of a Southeastern Conservation Adaptation Strategy (SECAS) by assessing the implications of climate change and other drivers of landscape change for existing conservation goals and management objectives. 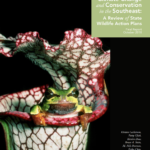 The Southeast is currently undergoing high rates of population growth, urbanization, and land use change and is expected to experience future changes in climate which will add to the above impacts on threatened species, wildlife communities, and habitats. Many existing conservation plans, programs, and activities focus on protecting and managing systems to maintain their current state or return to a desired, historic state. With large, landscape-scale transformations already occurring, adaptive conservation strategies that can account for changing conditions are needed. To assist in the development of such strategies this project will: 1) identify the goals, priorities, and management actions of major Southeast conservation plans and review the extent to which they address future changes; 2) assess existing goals and objectives with respect to plausible future scenarios of land and climate change impacts in the region; and 3) based on these analyses, engage state and regional conservation decision makers through structured decision analysis methods to identify principles and approaches for incorporating landscape and climate change considerations into current and future conservation activities and plans. Project products include reports on the assessment findings and content for the SE CSC Global Change Forum, including information about the stakeholder engagement process, reports on in-depth problem-solving case studies, and visualizations of scenarios of change in the Southeast. Ongoing engagement with the SECAS leaders and other relevant decision makers throughout the project will ensure the applicability and usefulness of the information for the Southeast conservation community and its efforts to develop a collaborative, long-term strategy for regional conservation action.